Great photos, thank you, Blind Boy Zimmerman. No love, it does nothing for me anymore. You don't have to understand, friebnds still. Happy for anyone who still likes it. Wish they could explain why. For this type of show it might be better not to sit in one of your front rows. Perhaps you'll be closer to the show when you're some rows more distant from the stage. (Although I'm no fan of Bob persistence playing the same setlist again and again, although I'd love to experience the sensations of former times (1995 - 2007), I'm again and again impressed by the shows, especially by the full force of the slower Bob-tunes (Autumn Leaves included). They are still overwhelming and stunning. I haven't seen any shows from this tour, and I won't be. The last show I saw - at the Albert Hall, with Dylan performing a similar set that mainly comprised a mixture of recent Dylan songs and crooned 'standards' - was incurably lifeless. The dull plink-plock of Dylan's off-kilter piano playing doesn't help, of course: pretty much every song performed by Dylan at the piano exudes minor key miserabilism. No song ever gathers pace, ebbs and flows, or forces itself into my attention through its musical propulsion. Song after song just sits there, or rather lies there, somewhere in the distance; possibly alive but more probably dead; never gaining enough of my attention to persuade me to find out. And when he steps away from the piano, when things should improve musically for his absence from that instrument and his increased attention to his singing, the deathly tone remains. These songs are so dead they are beyond resuscitation, and Dylan's throaty attempts at them only heighten the morbid atmosphere. The whole thing is so completely lifeless, so relentlessly joyless, so utterly depressing. Is there any way back from this? Is this how Dylan intends to play out the remainder of his career? God, it's all so awful. Thanks for this. That's 100% how I have experienced the shows in recent years. Every now and then the old spark returns (Mainz 2015 for example, when it was actually fun to guess what they would do in the second half) or Düsseldorf 2015, which for inexplicable reasons was fabulous despite no obvious changes. I feel the same way - and I also feel that none of the explanations from people who seemingly enjoy the shows don't work for me. I just assume that people who praise the shows may lack perspective and have never seen Dylan put on a really great show, with great songs (of his own! ), great dynamics and lights! Real lights! Maybe even (some) banter. Or they might not have a lot of experience with live music outside of seeing Dylan and think it won't get better than this? Like JP, I'm happy for anyone who pays increasingly more and still get their money's worth, but it honestly puzzles me how anyone could actually believe that Dylan and the band are killing it at these snoozefests. I just assume that people who praise the shows may lack perspective and have never seen Dylan put on a really great show, with great songs (of his own! ), great dynamics and lights! Real lights! Maybe even (some) banter. Or they might not have a lot of experience with live music outside of seeing Dylan and think it won't get better than this? It's ok, that you don't like the actual shows. But don't tell us others, that your problem is our problem, that we poor fans don't have your experience and because of this lack of experience don't know, what we are missing. I don't want to pick a fight or anything, but I didn't say it was like that, I said "I assume" that it is that way until I or someone else comes up with a better explanation. As for my other comments, I stand by them. For example, I saw Nick Cave for the first time in 20013 and loved every second of it. Afterwards I talked to tons of people who thought the shows sucked and lacked energy, compared to what Cave did 20 years earlier. I feel it's the same way with modern day Dylan. That's not to say that people who saw Dylan in 2000 or 1990 or 1978 or even 1965/66 are better or anything, but they might have experienced a different kind of greatness on a Dylan stage. I do realize that greatnes is hard to quantify, but there's a ton of people out there - Joe Henry and Lisa Hannigan being just two - who put on shows with a similiar low-key vibe to Dylan's but with a much bigger scope as far a pure musical quality and and ultimately uplifting atmosphere as concered. I'd find it very plausible that people who don't know these kind of artist's live work, enjoy the current Dylan show more than those who do. Again, my personal explanation until I get proved wrong. I'd find it very plausible that people who don't know these kind of artist's live work, enjoy the current Dylan show more than those who do. Again, my personal explanation until I get proved wrong. I know all these artists you mentioned and lots of others too. And I go to shows since 30 or 40 years or so, so look for another eyplanation, why I like what you don't like. Perhaps it's your lack of sensitivity for these actual shows, what does't make you unsensitive for others. Yes, I realize, that these shows and these cds, Bob is playing and producing, aren't of that kind, I would prefer. But writing that (and having written that before) I was quite surprised, that the show (not the cds) were better than I had expected. And - as written before too - the setlist of the shows are more relevant for our times than I had thought. I've seen 'great' shows in 1995, 1998, 2000, 2001, 2002, 2003, 2004, 2005, 2007,2014, 2015 - and, yes, a few days ago in Hamburg, Lingen and Düsseldorf. My perspective and no need to argue. As said before: If you do not like the modern times, you do not have to buy tickets or buy the albums. That easy. Yes I pray for Peace. Great Little Richard singing! Thats heart soul! Thank You for letting me hear that gorgious song! As Oscar Wilde once said, 'Comparisons are odious' and yet, and yet... I remember subscribing to The Telegraph in the summer of '92 and the exact same debate was occurring then. In other news: where is tonight's setlist, and did Dylan encore with Mr Tambourine Man? thank you PiaM, you are very kind. yesterday i happened to talk with a man who studied military history and he emphasized the current world situation should be seen as a chess game. proactive dynamics, never telegraph intent, always advance. we both agreed to see it in the context of those in charge being seen as scholars of strategy to a benefit. but endgame is a verboten word in a town dedicated to obfuscation and so i pray it is not Ixion we have become if our mem’ry serves us well. "He learned a clear lesson. For although he received a sweet life among the gracious children of Cronus, he did not abide his prosperity for long, when in his madness of spirit he desired Hera, who was allotted to the joyful bed of Zeus. But his arrogance drove him to extreme delusion; and soon the man suffered a suitable  exquisite punishment. Both of his crimes brought him toil in the end. First, he was the hero who, not without guile, was the first to stain mortal men with kindred blood; second, in the vast recesses of that bridal chamber he once made an attempt on the wife of Zeus. A man must always measure all things according to his own place. Unnatural lust throws men into dense trouble; it befell even him, since the man in his ignorance chased a sweet fake and lay with a cloud, for its form was like the supreme celestial goddess, the daughter of Cronus. The hands of Zeus set it as a trap for him,  a beautiful misery. Ixion brought upon himself the four-spoked fetter, his own ruin." "Inmates of Tartarus. 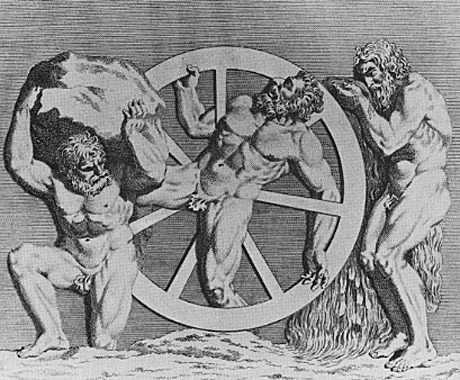 Sisyphus, Ixion, and Tantalus, punished in the Underworld." "Description: English: A Bible opened to the Book of Isaiah." For me, it´s very easy to say: It´s cause I like the current concerts. I´ve heard people saying that Dylan shows 1978 and 1991 were much better than today. I can´t understand that. But that´s okay. Every time has it´s moments. I enjoy modern times Dylan. That´s it. There it is. The Düsseldorf bootleg CD cover. Nice! This show is worth listening to. Seems to evidence something of a change in approach: sounds more ballsy, rougher, less refined than a lot of the 2013-2016 shows. Most notable is Bob's more attacking approach to the piano - some really great 'hammering' lines. ERK is transformed - the whole band finds a different angle of approach. 'Old Black Magic' is given a more full-throated vocal treatment. On the whole, it's as if the finely-honed sets of the last few years had been dusted up a bit, dragged across the cobbles. Interesting. Any sign of the Dusseldorf Girl? An odd thing to wish for... Is it really annoying you that Bob has lost you along the way. Do you feel like Mr Jones?